We’re only a few weeks away from the 40th anniversary of the first Moon landing on July 23, 1969, so if you’re up for making a remembrance model, then now could be the time to get started. Among the best kits available at present are Revell’s reissues, labelled under the series title, ‘Buzz Aldrin Rocket Hero’. The 1:48 scale Lunar Module and 1:32 scale Apollo capsule are both well-produced, and highly recommendable, as is the 1:144 Saturn V.
When it comes to finishing, for that extra sparkle, it’s worth taking a trip to a museum that has some real-life Moonflight memorabilia on hand - there’s nothing like reproducing details that you’ve actually seen, photographed, maybe even measured, to sprinkle magic dust on a model. 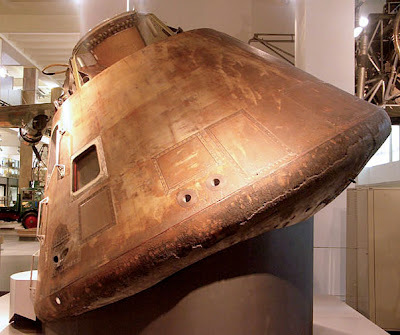 An Apollo capsule (top pictures) is on display at the London Science Museum, so for any Brit model fan, it’s a good excuse to make a visit. 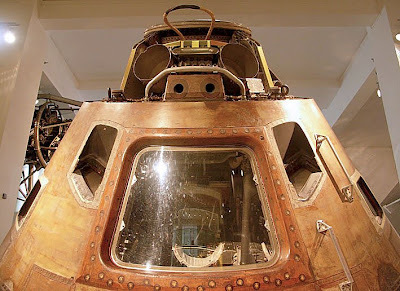 Also at the Science Museum is a space gallery, with fascinating stuff on show. 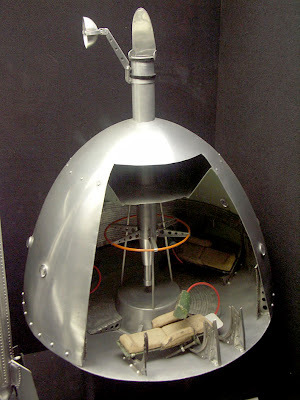 You can also see a model of a British Interplanetary Society (BIS) space capsule study (bottom picture), conceived long before Apollo was even a twinkle in Wernher von Braun’s eye. The BIS is a highly regarded organization that has been on the leading edge of space activities since it was set up in 1933. Revell space kits are widely available; you can see the range at Revell’s site here. The BIS can be viewed here, and the London Science Museum is here.